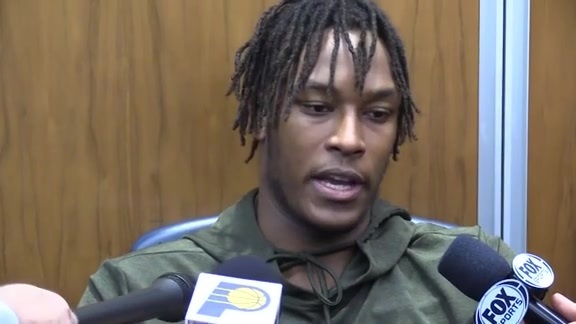 March 24, 2019 - Aaron Holiday, Doug McDermott, Myles Turner, and Bojan Bogdanovic discuss Indiana's 124-88 win over the Denver Nuggets at Bankers Life Fieldhouse. 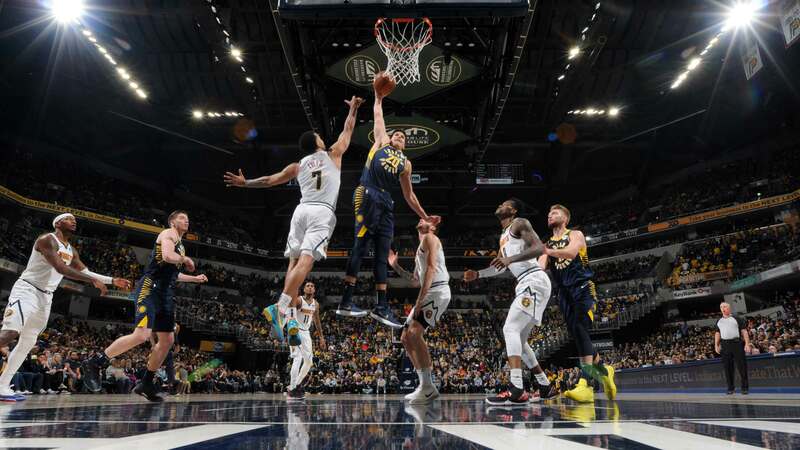 March 24, 2019 - Pacers forward Bojan Bogdanovic scored 35 points on 13-of-16 shooting in just 25 minutes of action in Indiana's 124-88 win over the Denver Nuggets. 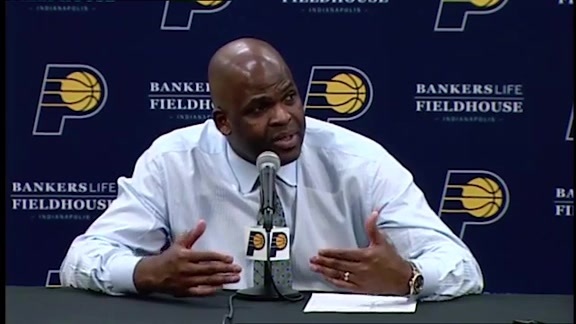 March 24, 2019 - Pacers head coach Nate McMillan discussed Indiana's 124-88 win over the Denver Nuggets on Sunday night at Bankers Life Fieldhouse. The Pacers went winless last week over a difficult four-game Western Conference road trip, but they bounced back within the friendly confines of Bankers Life Fieldhouse on Sunday night. Bojan Bogdanovic scored 35 points in just 25 minutes as Indiana (45-29) routed the Denver Nuggets (49-23), 124-88, to remain in fourth place in the Eastern Conference. The Croatian sensation put on a show for the 17,923 in attendance on Sunday, hitting his first 10 shots and finishing the night 13-for-16 from the field, 5-for-6 from 3-point range, and 4-for-4 from the free throw line. Seemingly the only thing that stopped him from surpassing his career high of 44 was the margin. With the Pacers nursing a comfortable lead, Pacers head coach Nate McMillan was able to rest his leading scorer for the entire fourth quarter. "Everything was going in," Bogdanovic said. "A lot of easy buckets, easy shots. They're the second (place) team and we dominated every category tonight." Bogdanovic and Myles Turner carried the load offensively for the Pacers early, scoring 22 of Indiana's first 24 points. Bogdanovic scored 12 points while knocking down five shots in that span, including two 3-pointers. Turner — celebrating his 23rd birthday on Sunday — tallied 10 points on 5-of-8 shooting, including an impressive play where he pushed the break himself, took the ball coast-to-coast, and threw down a two-handed slam. The Pacers led by as many as seven points in the first quarter and took a 27-23 advantage into the second. Doug McDermott scored six quick points as the Blue & Gold opened the second quarter with an 11-4 run to push the lead to double digits. Bogdanovic reentered shortly thereafter and picked up where he left off, scoring all of Indiana's points during a 12-4 run that stretched the margin to 17. The Croatian sharpshooter finished the half with 26 points, going 10-for-11 from the field and 4-for-5 from 3-point range as Indiana took a 62-46 lead into the break. EVERYTHING is going in for Bojan. "The way we were moving the ball was so much better than what it's been the last couple games," Turner said. Denver climbed within 11 on Will Barton's tip-in with 8:49 left in the third quarter, but once again Bogdanovic took over. He scored nine points and Wesley Matthews added a pair of threes as Indiana reeled off a 19-6 run over the next 5:17. The Pacers took a commanding 92-67 lead into the fourth quarter. With the game well in hand, Thaddeus Young was the only Pacers starter to see the floor over the final 12 minutes. The win avenged a 102-100 loss in Denver eight days ago. "We looked at a lot of film from our last game against these guys," McMillan said. "Better execution, better spacing, better ball movement, defensively we were connected against the second-best team in the West. This is a really good win for us." Birthday boy Turner finished with 17 points on 7-of-15 shooting, 11 rebounds, and two blocks. His backup Domantas Sabonis also recorded a double-double, racking up 15 points, 12 boards, and four assists. Fellow reserve Tyreke Evans joined them in double figures by tallying 11 points, five rebounds, and three assists, while rookie Aaron Holiday chipped in 11 points and five dimes. All-Star center Nikola Jokic led the Nuggets with 19 points, 11 rebounds, eight assists, and four blocks. Will Barton added 15 points, while Indianapolis native Gary Harris scored 11 points on 5-of-6 shooting in the loss. The Pacers will have two days off before hitting the road for an important two-game road trip. They visit Paul George and the Thunder on Wednesday night in Oklahoma City before a crucial showdown with the Boston Celtics — who entered Sunday a game back of Indiana in the Eastern Conference standings — on Friday night. Even though he sat the entire fourth quarter, Bogdanovic's 35 points were two shy of his Pacers career high, set on Feb. 28 against Minnesota and nine shy of his career high of 44, set as a member of the Brooklyn Nets against Philadelphia on March 15, 2016. The Pacers outscored Denver 72-42 in the paint, surpassing their previous season high of 70 paint points set in an overtime win in Chicago on Jan. 4. Sabonis recorded his 26th double-double of the season and Turner had his 14th in Sunday's win. Indiana scored 25 points off of 17 Nuggets turnovers and outscored Denver 29-11 on the fastbreak. Jokic recorded his 43rd double-double of the year in the loss. The Pacers led by as many as 41 points and won by 36, handing the Nuggets their largest defeat of the season. Denver's worst loss had been a 142-111 defeat to Golden State on Jan. 15. 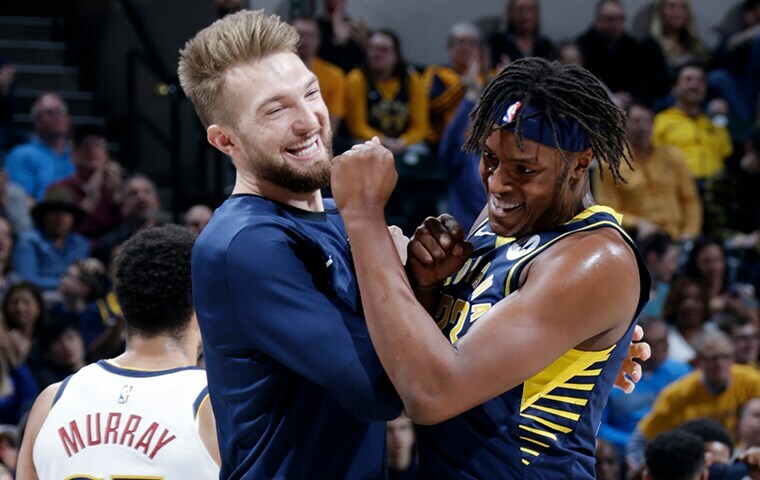 The Pacers have won two straight home games against the Nuggets and are 45-45 all-time against Denver, including a 30-16 record in Indianapolis. Pacers starting point guard Darren Collison missed his third straight game with a right quad contusion. The Fort Wayne Mad Ants, Indiana's G League affiliate, concluded their season on Saturday, so guards Edmond Sumner and Davon Reed and forward Alize Johnson rejoined the Pacers for Sunday's contest. The Pacers head to Oklahoma City to take on the Thunder in a nationally televised game on Wednesday, March 27 at 8:00 PM ET.